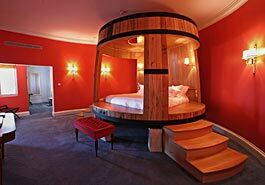 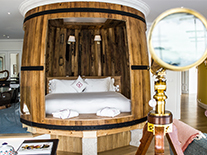 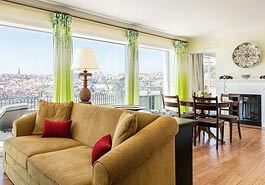 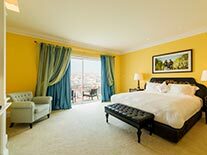 Named after the Roman god of wine, The Bacchus suite is the jewel in The Yeatman’s crown, with its spacious, open plan design providing the most exclusive and private accommodation in the hotel. 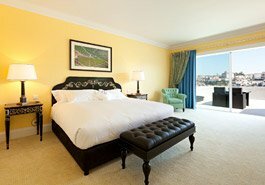 Boasting approximately 150m² in total, and a high vaulted wooden ceiling, The Bacchus Suite extends onto a furnished conservatory with fireplace and a private exterior terrace from which to marvel at the splendid panoramic views of Porto and the River Douro. 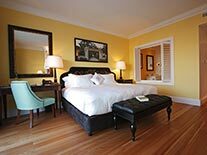 The furnished conservatory features a further fireplace and opens onto a large exterior terrace with a small fountain and deck beds, the perfect place to relax on a hot summer’s evening. 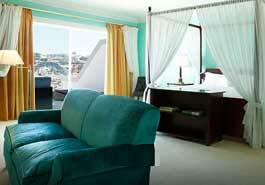 The Bacchus Suite also features a double shower and dressing room, lounge area with plasma TV and an office space. 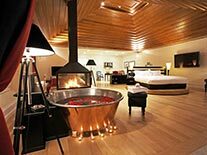 Wooden floors throughout help to emphasise the open plan design of the suite and maintain a light and airy feel throughout.